Most children start school before the age of six, when compulsory schooling usually begins, in a nursery school or a kindergarten. 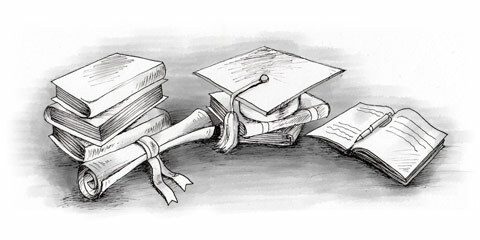 The maximum 13 years of formal elementary and secondary education covers education from 5 to 18, divided into increments called grades (kindergarten to grade 12). Children usually start in kindergarten or grade one at the age of five or six and go up one grade each year until reaching grade 12 at the age of 17. Occasionally a student must repeat a grade because of prolonged absence or low marks, although this is rare. The 12 years following the kindergarten year are usually organised under what is known as the ‘6-3-3 plan’ where grades 1 to 6 are in elementary (primary) school, grades 7 to 9 in junior high or middle school and grades 10 to 12 in a (senior) high school. Variations on the 6-3-3 plan include 5-3-4 and 6-2-4 schemes as well as the older 8-4 and 6-6 plans. Under the 8-4 plan students spend eight years (grades 1 to 8) in elementary school and four years (grades 9 to 12) in high school. Under the 6-6 plan students spend six years (grades 1 to 6) in elementary school and six years (grades 7 to 12) in a combined junior and senior high school. Irrespective of which plan is followed in a given school district, the basic state-decreed curriculum for each grade remains the same. Usually a student has one teacher for all major subjects during his first six years of schooling (elementary) and a different teacher for each subject during the last six grades in middle and high schools. Although a child can legally leave (quit) school at 16 (known as drop-outs), this is generally discouraged (the job prospects for anyone in the US without a high school diploma are worse than dismal!) and the vast majority of students stay at high school until 18. At elementary and secondary levels, students usually attend a public school close to their home. If you have a preference for a particular public school or school district, it’s usually necessary to buy or rent a property in that area. It’s quite normal for Americans to ask an estate agent to find them a home in a particular school district. All schools prefer children to start at the beginning of a new term (semester), although this isn’t necessary. Many towns provide transport to school (buses), although it may be provided for certain schools or ages only, and may depend on the travelling distance to school, e.g. there may be bussing only when the distance from home to school is over 2 or 2.5 mi (3 to 5.5km). Some towns provide buses for children in special education only. The school year usually runs from early September until May or June (nine months) and is divided into ‘quarters’ or terms (semesters). Some schools use the quarter system, which comprises three sessions: fall (September to December), winter (January to March) and spring (March to May or June). Others use a semester system made up of two sessions: fall (September to December) and spring (January to May). School vacation dates are published by schools well in advance, thus allowing parents plenty of time to schedule family holidays during official school holiday periods. Normally parents aren’t permitted to withdraw children from classes, except for visits to a doctor or dentist, when the teacher should be informed in advance whenever possible. If you wish to take a child out of school during classes, you must obtain permission from the principal. This is rarely given. It’s particularly unwise to take a child out of school when he should be taking examinations or during important course work assignments. The school day in elementary schools is usually from 8.30am to 3pm or 3.30pm, with an hour for lunch. In high schools, hours are usually from 7.30am to 2pm or 2.30pm. This is divided into six one-hour classes or four 90-minute classes (with a five-minute break between classes) and a 30-minute lunch break. Extra-curricular activities and sports are scheduled after school hours. Lessons in public schools are held from Monday to Friday and there are no lessons on Saturdays or Sundays. In most states, school children must be immunised against a range of diseases before starting school. These may include polio, DTP (diphtheria, tetanus and pertussis or whooping cough) and MMR (measles, mumps and rubella or German measles). Tuberculin screening may also be necessary. (If your children have been vaccinated against tuberculosis, be sure the school knows this, as they will test positive when screening is performed.) Evidence (in English) of the appropriate inoculations, including exact dates, is required when you apply to a school. It’s common for children at elementary level to take a packed lunch to school, although many children also go home for lunch when they live close to school. Milk is usually sold at elementary schools at snack and lunch times. Most elementary and secondary schools provide a self-service cafeteria where children may purchase lunch, and some children receive free lunches under local welfare programmes. High school students are provided with lockers where they can store their books and other possessions. Schools provide cycle racks for students who cycle to school and high schools provide car parks (parking lots). Which school to choose: Public or Private School?